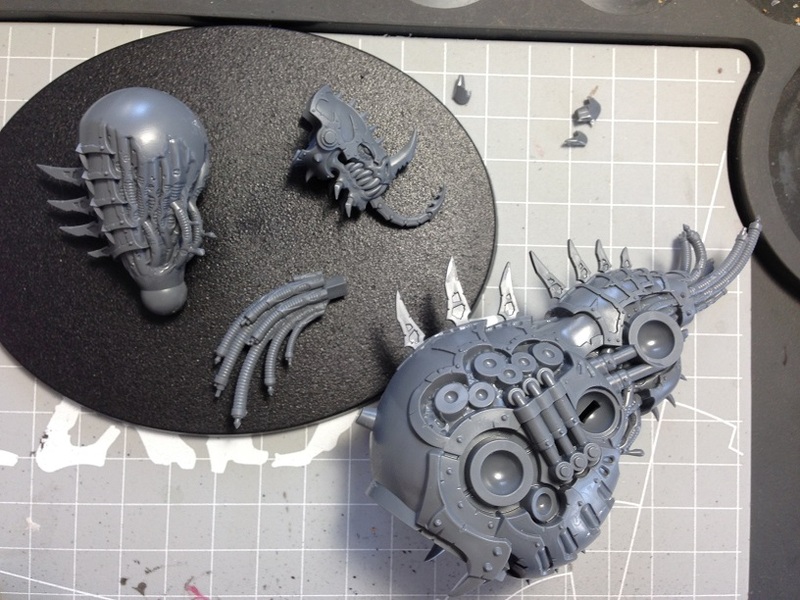 The Maulerfiend/Forgefiend kit comes on two sprue sheets that heavily resemble the Heldrake kit. The body is assembled the same for both variants, however the pose and armaments change to show their nature. The instruction booklet has two sides that show the steps for both kits and both start out with the same chassis. There are many modelers out there who have fully magnetized their kits to be interchangeable for both variants, however I want to paint this bad boy to display standards and won’t be fiddling with it too much. So I opted for the (in my opinion) cooler looking Maulerfiend for this kit and set to work. The whole assembly took something close to 5-6 hours in total (I work diligently) spread over two days. More ambitious modelers may have better mileage than I. Following the booklet, I put together the head, the neck and the body and prepared a piece of the “tail” from a later stage. First thing I saw when assembling the kit is that there are many join lines on especially the body. The reason for this is the two sides that make up the body, neck and head are not symmetrical, and their joining points have some serious gaps, especially after sanding out the few mold lines and sprue bits. These lines run in a crisscross fashion, just like it was on the Heldrake’s head, and will be difficult to fill in without obscuring detail. I’ll have to be very careful filling them out, for they run over a majority of the model’s visible surface. Next step I moved on to the arms of the model, where I thought the only confusing part of the kit was. The right arm is assembled in 4 pieces. The manual follows a strange way of assembling but I had a better idea. If you follow GW’s advice, the pieces for the fist are connected poorly. This assembled part is then connected to the arm, where you risk retouching the connection points. This piece in the open fits into the slot on the arm. Bad idea. Instead, I recommend putting the knuckle piece in the arm first, then close off with the rest of the hand and the wrist plate. Same shape but better control of the model. Here’s the last stabilizer piece attached. 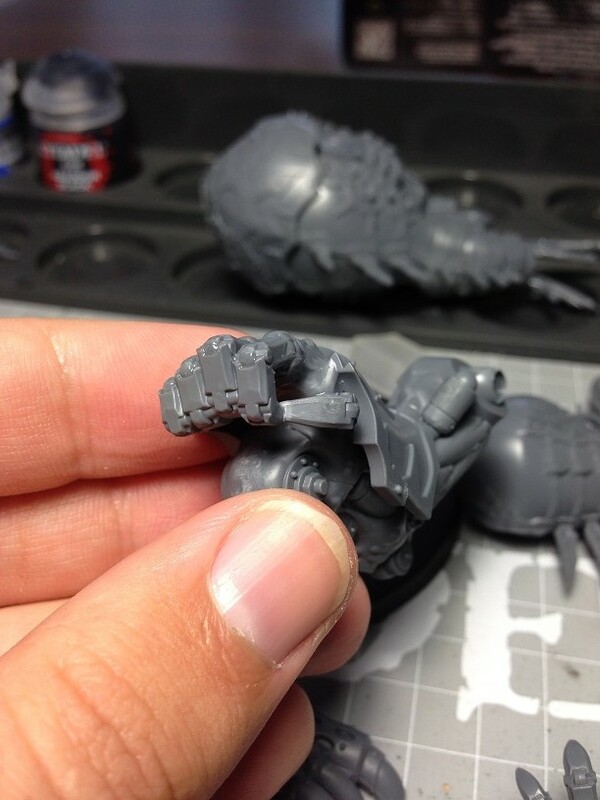 GW usually has a great way of explaining assembly, but the right arm was clearly not one of those moments! I recommend (as always) to double, even triple-check the fits first to see what goes where, especially for a kit with a dynamic pose like this one. … or right. Perhaps this design was intentional. The shape of the neck is not straight, it’s bent to the right by a little. I guess the GW team wants us to pose the model in a certain way. Of course it can be converted with the right tools but I’m not going to risk ruining a nice model with such extensive work. Moving on the next arm, the one defining the pose. Here we get the first bits of mold lines. They’re easily scraped away with the knife. … yes, they run through the insides too! I recommend a steady hand with the blade and lots of patience. It’ll be worth it. The hand, when assembled with the arm, show a garish join line. … all the way to the top. Good news is most of it can be hidden under the armor plate for the arm. With both arms assembled to the point where paint can be applied easily, I checked the pose on the torso. It seemed at first that the arms can be posed freely. Makes for an interesting challenge to have a believable stance. But apparently those stabilizers also have a spot to fit in and firmly tuck the arms in one pose. This is the piece that gets in the way. If you really want to pose your arms, remove it or convert it. Sadly, the problem with join lines on this model is quite prevalent, even on the arms. No matter how much I tried, the pieces do not fit correctly with their respective slots. Puts more work on the bench. Luckily, I’ll be getting new tools to apply modeling putty to the joins within the week and will have little trouble fixing them (or so I hope). More on this in a later post. The annoying thing is that the pieces have a detail that doesn’t match up. It will be very difficult to preserve the detail when putty is applied. More join lines. Not too extreme but will negatively affect the model during painting. The last pieces before the last armor plates that needed assembly are the mechatendrils (I love that word). The left and the right side are easily distinguishable: one has a wide rectangle shaped slit, the other a more square-shaped connection point. Another thing of note is that the tendrils sported mold lines that were very easy to remove. Running a sharp knife once over them easily eliminated the lines without hurting the details. With the mold line removed, the tendrils look smooth and deadly. Here’s an assembled piece. Three tendrils come into one non-poseable ball joint. Remove the extra pin piece if you want to change poses. As the last step I removed the rest of the needed pieces, the arm and leg plates, and proceeded to sort sub assemblies. Unlike the Heldrake, there aren’t too many sub assemblies. Torso, with the extra tail attached. Both arms, with respective armor plates. Exhaust pipes. They’ll be fun to paint! Might try a better OSL effect this time. The legs. I left out the feet both because it will be tough to paint and it is very difficult to align them to the correct pose. Will need some time with the tacks. Shoulder and leg armor plates. With sub assemblies sorted, I wanted to see the final form and applied yellow tack to connect the pieces. The UHU patafix works OK in this regard, but I recommend trying out other brands that have better bonding strength. Patafix also leaves particles if left on too long, so beware. The kit needs to be fixed on the base on all three connection points: the legs and the right arm. I used the clipper cap to keep the model upright. I love the menacing, hunched pose. The back view clearly shows the difficult mold lines and my poor tacking skills! I can already foresee the feet becoming a problem during final assembly. Here’s a little size comparison. The Dreadknight towers above the Maulerfiend even without a base, but the demon engine fills the oval base in a much more pleasing manner. My last shot is meant more as a warning. During posing I realized that the right hand was getting bent at the connection point and was about to break. To get around, I had to fully assemble the arm with the plate. Will complicate the painting process a little, but at least I do not need to repair the kit. So if you have to pose your model, don’t leave the model on for too long on this hand! I bent the piece back to position and assembled the hand. Be careful posing your miniature folks! So, next in line will be filling out the joins and sanding to a smooth finish. Then I’ll prime the pieces with the new Vallejo black primer I got a few weeks ago and the kit will be ready for painting. See you on the next post! Looking great! You definitely chose the right model. The tendrils are definitely the cooler of the options. Have you though about modifying the spike on the neck to allow more posing movement on the model? Thanks Greg, always a pleasure to have you around. I like the model to be unnerving as a chaos model, so what better part is there than tentacles when it comes to messing with stuff? As said I’m not going to risk this one to modify extensively, so I’ll go with the GW recipe for now. Maybe on the next few I’ll try converting, but I mostly buy models not to convert but replicate the box art. Yes, it was a different level of pain when it came to removing all the extras… at least the tentacles with all the ribbed parts were a breeze. Have you seen the new fantasty models? I think I’m going to buy one to actually paint. (just paint). It’ll be my first purchase just for display. What is your favorite part about the process? The building? The painting? The completion? The one thing that always drives me nuts about the chaos figures…is they are so spikey. Between them and tyranids, I always end up poking myself badly at some point :). I just saw the teasers on the various WH related facebook groups. They look absolutely lovely would very much like to get my hands on some of the new ones. Nagash looks quite intimidating. Currently I’m burning through the kits I already have so that I have some reason to look at the newer models! I have to say that showcasing a model is the most satisfying, a second close is the painting, if you have regular paints that don’t betray you midway (I’m looking at you, Imperial Primer). With any model I like to try out a few new things, like I did with the Dreadknight and I have a few plans laid out for the Maulerfiend too. That I think is the best way to keep enthusiasm going all the way to completion. So you’re complaining about Chaos spikes… I wonder how you’d fare with Dark Eldar models? I think they’re the only army with spare spikes on sprues whereas other armies have guns or arms or something. But yes, the Heldrake and the Maulerfiend did prick me bad at times when I didn’t know where to hold them, but you get used to it! My friend plays dark eldar. I told him I’d be happy to paint some bases for him, but the models are just so tiny…it’s approaching the scope at which I no longer have the fine motor control to paint properly. I think I’d have to get a magnifying glass, and new set of tiny hands to paint them. I do however like their larger models (like the talos), which has a very chaos-like vibe. I have grown very fond of the larger models as well. The largest models after this kit in my collection are the Tyranid Trygon and the Dark Eldar Ravager. I don’t know why but the Dreadnought sized models always looked really big on the showcase but when I saw the Helbrute I was a bit disappointed in its size. I haven’t checked my primer since the last time it covered green, perhaps I’ll try your idea if I can get a hold of the beads you speak of in Turkey. In the meantime I got my hands on a Vallejo black primer spray which I tried on the Dreadknight base. I’ll share my remarks in the next Dreadknight post. In short I think I am applying the spray paint too little (I’m a bit stingy like that). Being neat even during basecoating is a great habit, just because you might miss huge details later on during cleanup and miss a spot or two. The trick to achieving GW store style paintjobs is definitely patience and diligence, both of which I’m sure you possess. You can use standard stainless steel ball bearings as well. I just use a lot of magnets in my models (to the extent, that you have to be careful with tape measures around them! ), so I was trying to find a solution that would not effect the paint, and wasn’t metal. (ceramic beads supposedly work too). It’s really just something to help mix the paint. Just gotta make sure it won’t rust or effect the paint. Don’t tell me to be neat during base coats, it’ll take 400x longer now :). I always find that I am sometimes surprised by the size of models when I see them in person, as I generally only see them on the web. Then I’ll visit a store or event, and wonder why things are so small. Photography really messes up our perceptions sometimes! Curious on the vallejo primer. I used their grey primer in my airbrush on some of the templar vehicles, and it worked pretty well. Haven’t tried their black yet. I always find using the least primer possible is best. Last thing you want is to cover up details!